If you’ve been lucky, you’ve found yourself in some college dorm, surrounded by DayGlo tapestries, Nag Champa wafting in the air, stinging your eyes. Your singularly nicknamed but gracious hosts and their friends argue. It’s always the same argument: over the so-called greatest Grateful Dead show ever. More often than not, they were arguing about the merits or flaws of Cornell. May 8, 1977. Or maybe it was at a record store. The store’s owner was “there” but can’t remember a damn thing, minus the “One More Saturday Night” encore on a Sunday night. Oh wait, there was the infamous “Take a Step Back” and that “Dew.” The Dew. Cornell is mythical though, and for good reason. 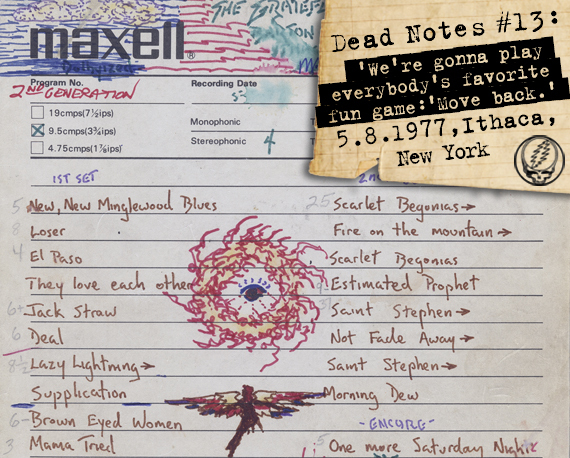 The tapes and name are ubiquitous to every collection and discussion about the band. The venue only held 8,500 attendees, but four times that amount will tell you they were there. Some will tell you it was a CIA experiment that never happened. Some say you’re not a true fan if it’s your favorite show. There’s a stigma associated with being a Cornell apologist. But why be unapologetic when it’s right there on the tape? It smokes. A spirited first set is capped by a never-ending version of Martha and The Vandellas’ soul hit “Dancing in The Streets,” offering the audience a sneak peek into the wrinkle in time they are about to experience “30 minutes” later. The second set’s near flawless. The band conjures up the spirits of Ivy League drop-outs who jumped in busses a decade before and headed west to change and find the new world. Someone said to me recently we’re lucky to live in the same millennium Jerry and the Dead existed. Pizza is pizza, sure, but wouldn’t it be boring without pepperoni and cheese? Well, they were back, there was no getting around that. We had seen them off back in Jersey City in 1974 and were well informed about the Ouroborian hiatus through the newsletter. A quaint document by today’s standards and inside there was something to the effect of…the intent of the widespread touring was not to create this steamroller of music that we would follow around from here to there but instead to plant a seed and we would do as they did. Form and grow a community, of which the music would be a part, and nurture that community because it would be more efficient that way. I would hear that intent again, while listening to “The Music Never Stopped” – “Were they really here at all?” But I digress. There was the East Coast mini-farewell in the summer — a huge wonderful show at Roosevelt Stadium! If you can find an image of the ticket on-line you may notice that the date on ticket does not match the show date. You will also see the words “To Be Held Rain or Shine”. That part is a lie. Look up hiatus, if you will — a break, a pause. So that part is not a lie. So when I traveled West to see the band at Golden Gate Park in 1975 — the pause was not even a year old. And then, they were back! We, on the other hand, had never left. This time, now Spring 1977, my friends and I were now living in Oneonta, New York. I left Staten Island to attend college there in the Fall of 1971 and stayed around. If you can locate my high school yearbook, it will tell you that I intended to major in Poli-Sci at Cornell. So, it was half right. As I was saying, they were back and with a vengeance or so it would seem from the available dates. Now we are talking pre-mail order here, folks. 10 years later I would gladly pay more for Registered Mail than we paid for a ticket on May 8 in Ithaca, New York. There were a bunch of us. In a van, straight out of central casting, trundling our way from Oneonta to Ithaca. Let me emphasize that this was closer to a Sunday night drive than event. As passionate as we were about the band the whole day had a “Hey, the Dead are in Ithaca Sunday!” feel to it. Spring comes begrudgingly to upstate New York, if it comes at all, so it was cool. The scene was decidedly different from the hockey arenas of 1974, my beloved Roosevelt Stadium, and a world apart from the Auditorium Theatre shows of 1976. Barton Hall was a field house. A Latin term meaning “without any trace of charm.” May as well have been Barton Barn for all that mattered. But it was general admission for us. I do remember these enormous windows, a whole wall of them. And as it began to darken there was a cathedral like effect to the interior. Now there was a curious phenomenon at these GA events. Some folks would attempt to stake out and secure small patches of ground for themselves and their tribe. Others would simply float. To the former, the latter were violators, trespassers. The latter saw their efforts as an uptight attempt to colonize a free space. Always plenty of free theater in those days. So — to recap: no seating, no merchandise, no beer sales, no Greenpeace. There was only the band with their fans and the air to help convey the music. The sound was fine — objectivity now, slightly shattered by certain indulgences. But we were in. Together. More or less in line, you know the deal. We snaked our way towards the stage as soon as the music started. Not right up front though — we struck a balance between hearing and moving. We needed to do both. Should I talk about the music? Do we need one more word? One more “jaunty,” another “rollicking”? So much has been written about this show it boggles the mind. A book even! Someone wrote a book about a show I was at!?! It was a grand night, as most of them were. It would be some time before the legend picked up steam however. Just look at the set list. Set one: start to finish, “polished like a golden bowl, the finest ever seen”. I am okay with that. I do distinctly remember thinking that somehow we would not survive the “Dancing In The Streets.” It was too much, too fast. I can not count the times I have listened to the “Scarlet Begonias” into “Fire On The Mountain” since. If you can stay still, you are a better man than me. Best “Morning Dew” ever? Don’t ask me. I don’t deal in that. Never did. But it is goddamned flawless I will tell you that. “One More Saturday Night” on a Sunday? I am okay with that one too…it was no skating rink, but for a minute, it almost became airborne. So that was that. Our “springtime wet with sighs.” We left to find Jim’s blue van. Tossed back a couple of beers to kind of recalibrate. And then back on the road home. If you told me on that ride back to Oneonta what that night would become, I would have laughed myself silly. Most requested show ever, UFOs and the CIA, Betty Board here and gone and back again, a box set, Plangent Process, and a book. All for one Sunday night…go figure!